The number in A is ten times higher than in B. Figure A is 30% lower than figure B. There is less than half the amount of rainfall in A as there is in B. The charts show information on life expectancy and average income (GNI) in six countries. Summarise the information and make comparisons where relevant. grams compare average life expectancies for men and women and average personal income in six very different countries around the world. If we look at the first chart, we can see that overall, women live roughly five years longer than men in all the countries. At 85 years, women in Japan have the longest life expectancy, closely followed by Australian and German women (83 and 81 years respectively). Malaysians and Brazilians have a shorter life expectancy, and people in India have the lowest, with women only expecting to live to their mid-sixties. In chart two, we can see there is a massive difference in average incomes. Japanese, Germans and Australians all earn over $30,000 a year. The figures for Malaysia and Brazil are much lower, at around $5,000. In India, the average is only a few hundred dollars. In conclusion, it seems obvious that there is a strong link between a country's wealth and the health of its citizens. 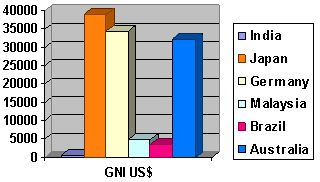 The charts illustrate that information on life expectancy and average income (GNI) in six countries. In chart one, India men is 65, women is 65. 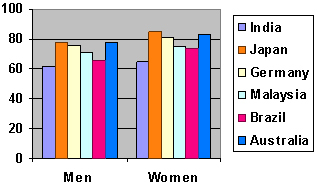 Japan men is 78, women is 85. Germany men is 76, women is 81. Malaysia men is 71, women is 75, Brazil man is 66, women is 74, Australia men is 78, women is 83. In chart 2, India is so poor. They do not have the economy or industry because there is farming and it is not developed. Japan is the number one because it makes the great things everybody wants to buy, like Sony Playstation 3. But maybe one day China will catch up and be the number one. In conclusion, we need to work hard to improve the economy in Taiwan, and the life expectancy.